So today switching hostels to Layday to see what that is like, somewhere in a better location and slightly livelier. Another scorching day it’s hard work getting a taxi there with at first no ubers being available and then when one is, it doesn’t come to the right place as the hostel is very hidden. So I end up most of the morning trying to find my uber standing out in the street in the sun with couple of swedish guys who are also trying to get a taxi. As I don’t think mine is arriving I start to flag a few taxis down only to get ridiculous prices for a 10minute drive, but luckily my uber Albert then turns up a little bit flustered as been driving up and down the past 30minutes. Im just pleased to be out of the heat and on my way so can hit the beach and surf. Arriving at layday immediately it has a much nicer vibe and wish I had stayed here the whole time. Cute little rooms with their own terraces, a nice bar and pool area. You can tell it’s mainly surfers here too! In my room there is a Austrian girl called Teresa, who has just arrived and we get chatting. Both needing a scooter as apparently that is the only way to get to the beach, but a much easier road to it than at wavehunters. She has ridden scooters in Burma so is used to them, so sharing is a good way and at least I can have a go too and get used to them. Super cheap at only 50k plus 10k petrol for 24hours (£3 total). Tereza drives down first to the beach, but I have a practice at the beach and get on fine. The bikes are quite heavy, which is the only thing I need to watch. At OLD MANS beach I hire a board for 2 hours again so cheap at 50k (£2.50) and Teresa takes up a surfing lesson from the same place at 350k (£17). Unfortunately it’s not best surfing conditions as low tide, which usually isn’t a problem, but here where it is so shallow there are rocks on the seabed so when you come off the board it is quite dangerous. The first hour is ok, but after that I give up and just float on the board enjoying the waves as seen a few people already with cuts and grazes from the rocks. After the surfing it’s Bintang time looking out at the waves, before a bit of chill time laying on the beach watching the sunset, which is always beautiful. Especially with the icon Canggu rock in the backdrop. Once the sun is down, both hungry with only having some grilled sweetcorn earlier although one of my favourite things from Bali, we head to OLD MANS BAR for phad thai noodles. A little bit pricier than the other bar on the beach, still very cheap vs Australia prices at only 65k (£3.50). As this is the main place to go, it has a good vibe and is pretty busy already at 6pm and has a big beer pong competition on. Around 8 we head back, a little later than planned as they forgot Teresa’s food order annoyingly. I drive back and it’s no problem at all despite driving in the dark, as the roads are so quiet and it’s just one straight road back. At the hostel it’s busy with a few people sitting round the bar or outside on the terrace, with a guy from Shoreditch being quite amusing as super hyper after getting a few of us to pour jos into his mouth, plus in general being very East London so quite familiar. Checking into the room for the first time, there are two English girls from Cape Tribulation in the dorm, which is quite funny and a small world to bump into them in another country! Most people in the hostel are heading out to Old Mans Bar together, so it is nice it is social in that way although everyone still has to make their own way down on bikes as no taxis. There are a couple of dutch guys Ben and Levi (cool name like the jeans) who want to follow me as I know the way and a welsh guy called Alex who is very shy and quiet who asks for a lift on the back. I am a bit unsure at first since he is heavier than Tereza and because it is still only day 1 of my scootering experience. Once I get used to Alex on the back, it is ok apart from stopping or turning I ask him to help make sure the bike doesn’t topple as the bikes are so heavy just on their own. With all the boys there safely and dropped off, I head back to pick up Teresa so we can go in ourselves. Old mans is super crammed, so much busier than at dinner with all the tables moved to make a dancefloor. It’s also a total sweat machine with no air and the hot humid bali temperatures. I end up bumping into the guys from wavehunter hostel so hang out with them; while Tereza goes to the beach to watch the stars. Realising she isn’t liking the bar very much, when she gets back from the beach I offer to ride her back to the hostel since we are sharing the bike and otherwise would be left stranded or I would be later. So for a first day if scootering, I actually end up doing a lot of trips, which is a great way to learn a place. 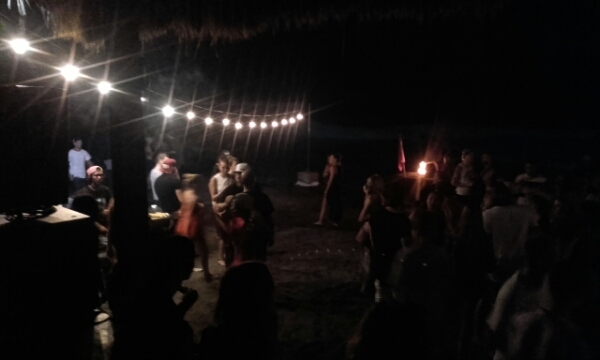 So final destination of the night is Sand Bar again, this time for a full moon party and drive straight there after doing the drop off. Like on Sunday it has a fun vibe, fire going on the beach and a lot of familiar faces from Sunday so hang out with them and the hostel guys mostly. There are a few new and fun faces like Canadian Amber and Ben from London, who is also a magician and has been living in Thailand for years. The party goes on late again and always fun dancing on the beach especially when the beach isn’t very crowded. As it is a full moon the water is really high up and cool to see the waves light up and look silver as they crash in under the moonlight. 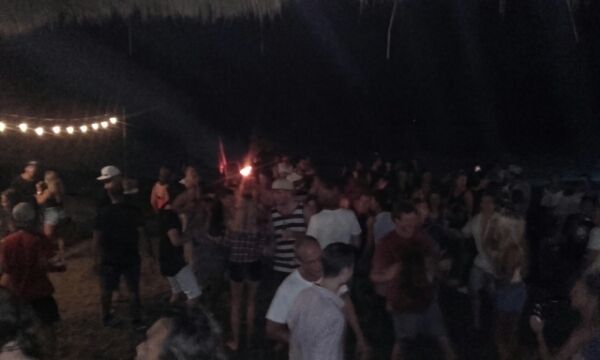 Definitely makes you want to go to more full moon parties!